This is the third and final post in which I present the Amicus letter I sent to Missouri Governor Jay Nixon in support of an absolute pardon for Byron Case. In Part 1, I provided an overview of the crime. In Part 2, I discussed how time-of-death considerations based on witness testimony exclude Bryon Case as the person who murdered Anastasia Witbolsfeugen. In this post, I will discuss how the postmortem medical considerations prove Byron Case to be factually innocent and wrongfully incarcerated. The field investigator for the Medical Examiner's office arrived at Anastasia's murder scene at 5:05 AM. Had he troubled himself to measure the body's core temperature, he would have found her core temperature to be around 92 oF if she had died near midnight, and around 81 oF if she had died near the end of nautical twilight. In other words, we wouldn't be discussing this issue today. The R/D observed the victims skin to be bluish gray and cool to the touch, and the victims eyes to be open wide. In one sentence, Deputy Epperson managed to preserve three time-of-death markers, if only crudely. I'll discuss the skin temperature marker in this subsection and discuss the other markers later. Skin temperature is not generally used as a time-of-death marker, though it could be. 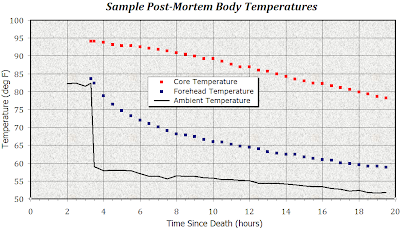 As would be expected, actual skin temperature measurements of cadavers in controlled environments show that the exposed skin temperature drops far more rapidly than does the body's core temperature. The outside of a warm object cools down much faster than the inside. Below I provide one set of measured post-mortem body temperatures. In the case presented, the person died of natural causes in a hospital setting. 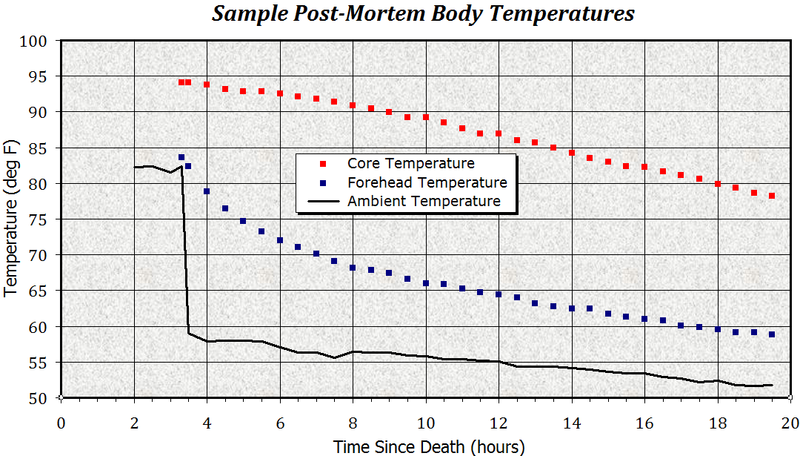 Core and forehead temperature measurements began at 3 hours postmortem and continued until 20 hours postmortem. For the first 3.5 hours, the body was left at room temperature, after which time it was moved to colder conditions, presumably the morgue. From the core temperature curve, it appears as if the person's core temperature was approximately 95 degF shortly before death. The skin temperature would have been slightly lower at that point. What is important to our understanding of Anastasia's time-of-death is that the exposed skin temperature dropped rapidly after death. In the sample above, the skin temperature dropped by approximately 12 degrees after three and a half hours, even though the body had been kept in warm conditions for most of that time. After eight hours, the skin temperature dropped by approximately 25 degrees. Anastasia's skin temperature would have dropped more rapidly than in the example above, since the ambient air temperature in Independence on that day was near 52 degF from 7 PM onwards. Had Anastasia died near midnight, her exposed skin temperature would been at least 12 degrees cooler than normal. Had she died near the end of nautical twilight, her skin temperature would have been at least 25 degrees colder than usual. Deputy Epperson did not measure her skin temperature. He made only a subjective assessment. He described her skin temperature as "cool." He did not describe her skin temperature as "cold." Humans are actually pretty good at detecting, by touch alone, abnormal skin temperatures. If a child has a fever with a temperature only 6 degrees above normal, a parent who touches the child's forehead is apt to describe the child as "burning up." If a friend touches the skin of a person who has been exposed to the cold outside air for any length of time, the friend is apt to describe the person as "freezing." The argument in Anastasia's case is simple, and while not compelling, it is mildly persuasive. Had Anastasia been killed before the end of nautical twilight, her body would have been exposed to 52 degree air for more than 8.5 hours by the time Deputy Epperson discovered it. Her skin temperature would have by then dropped well within 10 degrees of the ambient temperature. It's unlikely that anyone who touched the skin would describe it as "cool." Given that Deputy Epperson described Anastasia's skin as "cool", and given the subjective nature of that observation, Anastasia's skin temperature at the time of her discovery places her time of death more likely near midnight than near sunset. When the heart ceases to function, the blood begins to slowly flow from the uppermost to the lowermost portions of the body. The earliest manifestation of this phenomenon is pallor mortis, from the Latin for paleness after death. Soon after death, the uppermost portions of light-skinned individuals, such as Anastasia, will become pale. The onset of pallor mortis is so quick that pallor mortis is generally not useful as a time-of-death indicator. A later manifestation of gravitational blood settling is livor mortis, from the Latin for blueness of death. As the blood pools at the lowermost portions of the body, those portions turn dark blue or purple. Nominally, livor mortis will become noticeable 2 to 4 hours after death. It will become fully fixed sometime after 8 hours postmortem. Livor mortis is deemed to be fixed when the skin will not blanch in response to a finger press. Anastasia laid on her back from the time she was killed at least until the time she was transported from the scene. It's likely she remained on her back even after transport. During that time, the front of her body (including her face) tended to become more pale, while the back of her body tended to become dark blue or purple. When Deputy Epperson discovered her body at 3:44 AM, he made an interesting observation about her skin color. "The R/D observed the victims skin to be bluish gray ..." The fact that Anastasia's skin was not by then pale suggests that she was killed not long before she was discovered. The investigator from the medical examiner's office arrived at 5:05 AM. He allowed the body to be transported at 6:15 AM. In his astoundingly brief report, he addressed the state of Anastasia's livor mortis only to note he did not check it. "The body is fully dressed and post mortem lividity is not assessable." Once again, had he checked the state of Anastasia's livor mortis and had it not yet been noticeable, we would not be discussing the issue today. Anastasia's autopsy began at 9:30 AM. Dr. Thomas Young assessed the state of her livor mortis thus: "Livor mortis is faint and posterior, mostly in the buttocks and legs. Livor mortis is mostly fixed but focally blanching." Even 9.5 hours after midnight, 14 hours after the end of nautical twilight, Anastasia's livor mortis was not fully fixed. Anastasia's post mortem skin coloring places her time of death more likely near midnight than near sunset. The term rigor mortis is from the Latin for stiffness of death. After death, the muscles begin to stiffen. The stiffness becomes noticeable first in the smallest muscles and last in the largest muscles. Because of the muscular organization of the human body, rigor mortis tends to proceed from head to toe. The eyelids and jaws stiffen first, then the neck, arms, torso, and finally the legs. That means that's very subjective. I don't even know what the top number is that he is referring to, whether it's three plus or ten plus. To me that means there is some rigor mortis that he can appreciate. Both doctors make clear that Anastasia's rigor was not complete when the ME examined her soon after 5:05 AM. Anastasia's rigor was fixed when Dr. Young began the autopsy at 9:30 AM. I find only one study documenting the onset timing of rigor mortis. Amazingly, that study dates back to 1872. 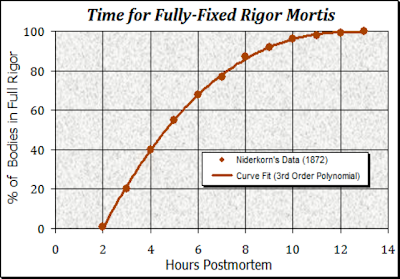 Dr. P. F. Niderkorn then made hourly observations of 114 bodies from their time-of-death to the time when rigor was fully developed. I repeat Niderkorn's data below in both tabular and plotted form. Niderkorn's data indicate that it is highly unlikely Anastasia was killed before the end of nautical twilight the previous day. That would be 9.5 hours prior to the beginning of the ME investigator's on-scene examination. 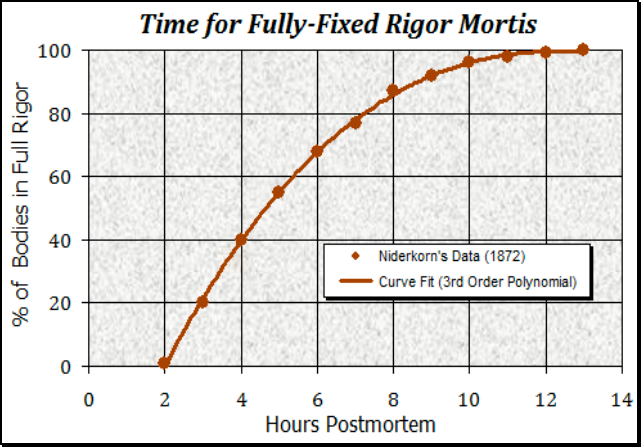 Referring to the curve fit of Niderkorn's data, rigor would have by then been fully fixed in 94% of all cases in which rigor was fully fixed. In other words, even if Anastasia's rigor had been more advanced than it was, there would be only a 6% chance she died prior to the end of nautical twilight, based on rigor mortis calculations alone. On the other hand, even if Anastasia's rigor had been more advanced than it was, there would still be more than a 55% chance that she died sometime after midnight. The state of Anastasia's rigor indicates that Anastasia probably died close to midnight. Anastasia died with her eyes open and her corneas clear. Together, those two observations establish that she was probably killed near midnight. Allow me to explain. Recall that Anastasia's eyes were open when her body was discovered by Deputy Epperson. Her corneas must have been clear when Epperson discovered her because her corneas were clear still when examined by Dr. Young during her autopsy. The body was brought to the morgue fully clothed and in a white tarp. ... Rigor mortis is well developed and generalized. Livor mortis is mostly fixed, but focally blanching. The corneas are clear. After death, the eyes begin to dry and to undergo autolysis. Autolysis is from the Greek for self splitting. The word refers to the process of an organ consuming itself via its own enzymes. Within minutes, these natural assaults on the eyes cause a thin film to appear over the cornea. Hours or days later, the corneas will become cloudy, then opaque. The rate at which these changes occur depends on multiple factors, including the position of the eyelids. If the eyes remain open after death, the corneas cloud quite rapidly, within a few hours. If the eyes are closed postmortem, then the corneas may remain clear for several days. 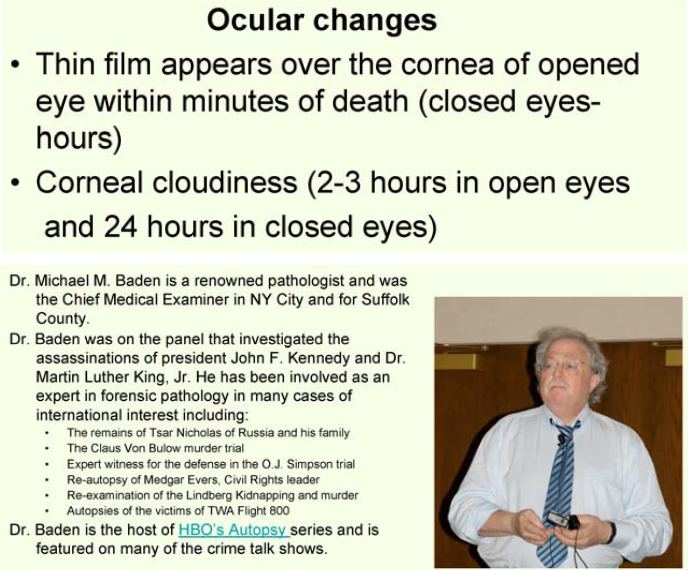 Multiple authoritative sources claim that corneas cloud over within 3 hours of death if the eyes remain open, and within 24 hours of death if the eyes are closed. One of the more prominent authorities on the matter is "renowned pathologist" Dr. Michael Baden. I presented just above two clips from one of his presentations. Another eye change is corneal clouding. It occurs 2 to 3 h after death, if the eyes are open, and by 24 h if they are shut. When the eyes remain open, a thin film may be observed within minutes on the corneal surface, and within two or three hours corneal cloudiness develops. 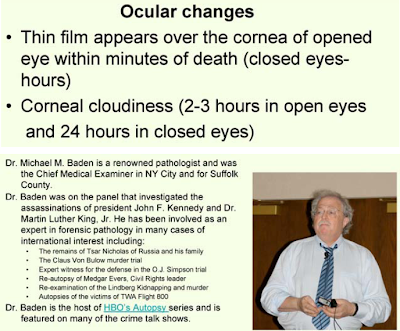 If the eyes are closed, the appearance of the corneal film may be delayed by hours and that of corneal cloudiness by twenty-four hours or longer. 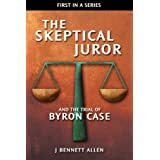 I have continued researching this subject since completing my book on Byron's case, and have since discovered two studies that provide additional insight. Wroblewski and Ellis wrote of 300 postmortem eye examinations in their 1970 work "Eye Changes after Death." They reported that only 74% of the corneas they examined were cloudy after 36 hours. They noted also that some corneas clouded over within one half-hour postmortem. Also, 48% of the corneas they examined between 1.5 and 2 hours of death were cloudy. Finally, they reported that onset of corneal cloudiness could be delayed by keeping the eyes artificially moist. BK Prasad wrote of 150 postmortem eye examinations in his 2003 work "Post-mortem Ocular Changes." He reported that all examinations took place more than 4 hours postmortem, and that in only 10 cases were the corneas not cloudy. In neither study did the authors distinguish between eyes-open and eyes-closed subjects. The weight of the scientific evidence is that corneas cloud over quickly if the eyes remain open after death, and cloud over much more slowly if the eyes are closed (or presumably otherwise protected). In Anastasia's case, it seems as if her corneas were clear upon discovery because she had been killed near or after midnight, and her corneas were clear at autopsy because her body had been wrapped in a tarp. If Anastasia had been killed before the end of nautical twilight, she would have had to lie there for more than eight hours with her eyes "open wide" before being discovered. It is exceptionally unlikely, in that case, that her corneas would have been clear upon discovery. Recall that Wroblewski and Ellis found that 48% of the corneas they examined within only 1.5 and 2 hours of death were already cloudy. Some of those eyes may have been closed; most were probably open. Recall also that Prasad found cloudy corneas in 93% of his examinations, since all of his subjects had been dead for 4 hours or more. Anastasia's open eyes and clear corneas therefore establish her time of death as probably near midnight. The investigator for the ME's office filled out report form and narrative describing his on-scene examination of Anastasia's body. In that form, he entered "10/23/97" as the Date of Injury. That would be the same day that Deputy Epperson discovered the body. Quite simply, the ME investigator filed a formal report stating that Anastasia WitbolsFeugen was injured on the same day she was discovered. That would be after midnight. There is no reasonable possibility that when the ME investigator entered 10/23/97 in the Date of Injury field, he was merely describing the day the body was discovered. There was a separate field for the discovery date. On the form, it was called the Incident Date. In the field for Incident Date, the ME investigator entered 10/23/97. In the field for Incident Time, the investigator entered 0344. The incident date and time correspond perfectly with the discovery date and time reported by Deputy Epperson. Nor is there any reasonable possibility that when he entered that date, he was merely describing the date of his investigation. There was a separate field for the date of his investigation. In the form, it is called the Report Date. In that Report Date field, he entered "10/23/1997." In the Report Time field, he entered 0410. The Report Date and Report Time fields apparently correspond with when he was notified of a body to be investigated. Nor is there any reasonable possibility that the ME investigator was required to write a specific date in that Date of Injury field. Assuming he was not confident about the date of Anastasia's injury, he could have simply left the field blank. Alternatively, he could have typed "UNKN." He did, for example, type "UNKN" in the Time of Injury field. The standardized Medical Examiner Investigator Report attests that the investigator is qualified to estimate the date and time of injury. It does so by providing the investigator fields for entering that information. The ME investigator who examined Anastasia's body evaluated the state of her rigor. He must therefore have touched her skin and made at least an unconscious assessment of its temperature. He must have also seen the color of her exposed skin. He must have seen the clarity of her eyes. We cannot ask him now what he felt or what he saw, because he has since died. We can only go by the information he placed on his official Medical Examiner Investigator Report. In that report, he willfully entered 10/23/97 as the Date of Injury. He chose to enter UNKN for the Time of Injury. We are left with the inescapable conclusion that he believed, based on his training and his examination of Anastasia's body, that she was shot sometime after midnight, but he was unable or unwilling to specify the time more precisely. The Medical Examiner Investigator Report establishes absolutely that Anastasia WitbolsFeugen was killed near or after midnight. Similarly, Anastasia's Certificate of Death (signed by Dr. Young) lists her Date of Death as OCTOBER 23, 1997. Once again, that is the same day that Deputy Epperson discovered her body. Once again, that is after midnight. It is possible, of course, that the Certificate of Death needed a specific Date of Death, even if that date could only be approximated. It is not reasonable, however, that the same certificate would demand a date in the Date of Injury field if such a date was not known. In the Time of Injury field, for example, Dr. Young entered UNKN. In the Date of Injury field, however, Dr. Young entered 10-23-97. Time-of-Death considerations establish with certainty that Anastasia was killed close to midnight, and they do so to the detriment of Kelly Moffett's veracity and her claim to the contrary. Byron Case clearly did not murder Anastasia WitbolsFuegen. Someone killed her near midnight and Byron was then at home. His mother places him there and Kelly Moffett herself places him there. She called him slightly before midnight and they spoke about the events of the day, fretting about Anastasia. Kelly does not dispute that Byron was then at home. No one does. Four eye-witnesses saw Anastasia alive well after dusk, well after the time of day when Kelly claimed she witnessed Anastasia being murdered. One eye-witness actually saw Anastasia step from the car and walk towards home, well after dusk, just as Byron has always claimed, just as Kelly claimed until Byron left her for St. Louis. One ear-witness, Anastasia's own father, places her time-of-death absolutely near midnight. Don Rand did not hear any such gunshot, though he was only half the distance to the crime scene. Don Rand did not hear the shot because he went home at 10 PM. Anastasia's wallet somehow made it home, well after dusk. The tampon provided by Dawn Wright (well after dusk) was not found with Anastasia's body. Since there was absolutely no opportunity in Kelly's post-rejection story for Anastasia to replace the tampon with a sanitary napkin, Kelly's post-rejection story must be false. Four medical time-of-death markers place Anastasia's death near midnight. Her skin temperature and coloration, the incomplete stiffness or her muscles, and the clarity of her corneas all testify to Byron's innocence. The Medical Examiner Investigator Report formally specifies the date of Anastasia's injury as the 23rd, sometime after midnight, well past dusk the previous day. The ME investigator was not obliged to enter that date. Anastasia's Death Certificate formally specifies the date of her injury as the 23rd, sometime after midnight, sometime well past dusk the pervious day. Dr. Young was not obliged to enter any date in that field. Had the jury been presented the time-of-death evidence I now present to you, we would not be corresponding today. I say this with confidence based on my four experiences as a juror. I have served as a juror for a drive-by shooting, an assault and battery, a multi-victim child molestation case, and a first-degree murder. I have voted both guilty and not guilty. I have favored counts more serious than preferred by my fellow jurors, and have argued for counts less serious than preferred by the others. I am confident that no jury of twelve citizens would have found Byron Case guilty of murder had they been presented the time-of-death evidence I have summarized herein. One of the many tragedies in this case is that the jury was left completely uniformed about the time of death issues. The jury heard not a whit from Dr. Young, or from the ME investigator, or Anastasia's father, or Dairy Queen owner Sulaman Saulat. None of those four were called to testify. The jury heard absolutely nothing about the medical time-of-death markers placing Anastasia's death near or after midnight. As I recall from the trial transcripts, the words time of death were never even mentioned contiguously and in that order. The jury did hear from Wanda Wright and from Glen Colliver. The testimony Ms. Wright and Mr. Colliver provided was, however, not inconsistent with the testimony Kelly provided, unless the jurors realized the subtle time of day discrepancies. Byron's court-appointed counsel did not himself recognize those discrepancies, and did not argue them to the jury. The jury did hear from Don Rand. They heard he saw the woman only from a distance and only while it was dark. They chose not to believe him. They chose instead to believe the embittered young woman who said she witnessed the murder up close, when it was still light enough to see. Governor Nixon, I pray that after careful consideration of Byron's petition and this letter, you will grant him an absolute pardon. If it would be helpful, I would be pleased to meet with you and discuss any matter associated with this case. SJ, in your book, do you discuss the phone call between Byron Case and Kelly Moffett? That transcription was the real factor that cast doubt over my opinion. Indeed I do. I suspect you will be surprised what I learned about that call. 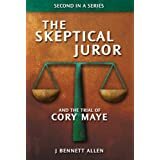 tsj: I read your writing on this case and also looked at the victim’s website and read there portions of the transcript of Kelly Moffett’s testimony at the trial. Based only on this bit of “research,” I wish to make an observation. Because you have analyzed this case in detail, you would be able to tell immediately if I am talking nonsense and keep me from wasting my time following a blind ally. On the other hand, if you think it makes sense, you could pursue it better than anybody. Of the four people who could be witness to this tragedy, two are dead and one is accusing the other. Let us assume that Moffett did witness the shooting of Anastasia that night. Let us further assume that she saw Justin do the shooting. After her rejection by Byron, she decided to blame him for the shooting. She then had to do two things. First she had to insert him at the crime scene. She then had to adjust the time-line to make it possible. Again, this could be total nonsense. I have been over all the transcripts, the autopsy, police reports, and interviews, multiple times, many times, ad nauseum. I have made minutely detailed timelines, down to the minute where possible. I have educated myself on ballistics, pathology, and telephony. I have obtained and learned how to use sophisticated audio analysis software. I have attempted three dimensional modeling of the crime as described by Kelly. I have spent money I wish was now available in these difficult economic times. I have lived with this case for two years. I have worn it to bed, arose and had breakfast with it. Though I originally invited it into my home, it is the annoying houseguest that will never leave. It is a despicable, loathsome guest, and I wish it would leave. I am trying as best I can to make it go away, but the challenge is greater than most people can fathom. I assure you I know this case well. I assure you as well that Kelly can no more be responsible for the murder than can Byron Case can be. And I assure you that Byron Case is not in the least way responsible for the murder of Anastasia Witbolsfeugen. tsj: I admire your extraordinary effort in studying this case and I do not wish to burden you with rank speculation. I did not regard Moffett as the suspect. I was simply wondering if she could have witnessed Justin (not Byron) do the shooting, because before she accused Byron for the shooting to a drug counselor, she had named Justin as the shooter to another drug counselor. Perhaps she drove around with Justin while the gun was discarded somewhere. She later made up the story about Byron out of anger against him, which is why the details of her account do not hold up. In your letter, you include statements and testimony of three people who placed Anastasia at the scene at about 9pm, which should be proof that Byron didn't kill her at the time claimed. Yet in your book you accept without question that these people were mistaken as to the time they saw them. Why use these to make a false claim? In your book you accept that they were wrong and that the time was closer to 7pm, and then in your letter say it was 9pm, as if they were absolutely correct. This seems to me an unwise strategy to offer evidence that can so easily be contradicted. If the Governor's Office actually reads everything you submitted, they will catch the contradiction, and it might harm the rest of your argument. Wouldn't it have been better to concentrate on your strongest arguments and leave such weaker links out? Also, in your book, in the chapter "Beep Beep Beep", you wonder at the beeps and faint conversation on the tape. That's called crosstalk, and is an occasional but normal problem on land lines, at least in the mid west US. There was no one in the room dialing another phone, it was just someone somewhere else in the city whose line got crossed. I don't believe I accepted without question that three witnesses were mistaken about seeing Anastasia around 9 PM. 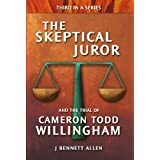 The prosecutor certainly challenged their claim, and I had the fictional jury attempt to reconcile the witness claims with the prosecutor's challenge. Regarding the phone call, the second set of beeps was as loud and clear as the first set. The first set belonged to Byron Case, and was clearly not crosstalk. The second set was likely not crosstalk. No other potential crosstalk was anywhere near as loud and clear. The significant point is that phone call was uncontrolled and subject to manipulation. Even the lead investigator described it a coming from "out of the blue." The prosecutor's suspected that a good PD would be able to exclude that phone call and so set up a follow-up call that was monitored by the police. In that second call, Kelly refused to even mention Anastasia. I note that you criticize my style rather than the substance of my argument time-of-death argument. I'll acknowledge shortcomings in my approach until the cows come home. I maintain, however, that a dozen time-of-death indicators argue against Kelly's version of events, and none argue in her favor. Byron Case was wrongfully convicted based on the testimony of an embittered ex-girlfriend whose story is falsified by all time-of-death indicators. I went back to the online transcript of the trial to be sure of this before writing, so I believe I'm now criticizing your substance. Byron Case told police in his first statement that they met Anastasia at the Dairy Queen at about 6pm. While he admitted to having a "horrible" memory, his other statements give weight to a much earlier time than 9pm. He testified that he thought he got Kelly to her home before 9pm. Kelly's mother testified that is was a little after 9pm, but still close to his statement. Byron testified it was about 30 minutes after leaving Anastasia that they got to Justin's condo, and that they spent 20-30 minutes playing video games at Justin's condo. They then visited a friend before they drove her home. That friend testified that they visited him about 8:30, which places them near the scene at 7:30 or earlier. Byron Case's website has a timeline of events which disagrees with his testimony, and places it even earlier. I believe that your first three pointers are wrong. I still disagree with your opinion on crosstalk. I frequently do interviews over the phone with people and record them. The device I use plugs into the phone's receiver jack and then to the receiver, and it picks up only what is on the line, and crosstalk can sometimes really be that loud, generally at night, but most people ignore it along with the hisses and pops. And since you mention it, I've been casually following this case for probably better than 10 years, and have read through the testimony, and both Kelly and Byron agreed that it was Kelly who broke up with Byron. I just don't see the "embittered" part of this, except as a claim made by Byron. Same person as before posting. I wanted to make clear that I'm not trying to start a fight, but that I am sincerely concerned about your first three time-of-death indicators. You offered these in your letter quite confidently. I have never dealt with this issue as directly as you are, but I did once help a friend prepare a petition on behalf of another to the Governor, and I have some understanding of the process. The Governor of Missouri is not the person who will initially read the petition. He will be advised by members of the Department of Corrections first, and they are not a sympathetic body, nor will they accept your statements without great skepticism. I think it would have been better to go with the best and hardest to challenge arguments, and not even include ones that might be challenged. I fear that if they find these first three easy to refute, they might use them as a cause to ignore or marginalize ALL of them. All that is great information, but is not really applicable to this particular case, and does not address the questions posted earlier. 1. The first three time of death indicators that were presented can be proven false. Why were they used in the first place? 2. What is the proof that Kelly Moffett was an "embittered" and "scorned" ex-girlfriend, when both her and Byron's testimony indicates that she broke up with him long before she accused him of murder? While the truth may set you free, I'm afraid that it will take PROOF in Byron's situation. I'm 90% finished with the book, which is excellent by the way. I'm left wondering...is it possible Anastasia was at the DQ twice that evening? First, in the late afternoon waiting to be picked up and then could she have possibly returned there at close to 9, trying to decide what to do. Then she made her way back home and then back out again? Is that a possibility? It's possible, but I doubt it. Neither of the two employees who reported seeing her mentioned two visits, just the one. TSJ, I just finished reading your book, and I must tell you that I am absolutely floored by what you have accomplished within it. I learned a great deal about how to be a responsible juror should the State of Missouri ever call me. But I also now fully understand that Byron Case, who I am not affiliated with in any way, must be innocent of the murder of Anastasia Witbolsfeugen. I am ashamed that officials in my state could act as recklessly as what you have shown us. I am going to send my own letter to Governor Nixon supporting what you advised him of. I will also be reading your other books. Nice work. Thank you for the kind words. Thank you even more for taking assertive action in trying to free Byron from his wrongful imprisonment. It has been almost a year since you wrote your Amicus letter to Jay Nixon's office, I am curious if you have gotten any kind of response. I realize you may not be able to talk about it, but I thought I would ask. Every 100 signatures we reach I will be sending the petition and signatures to Governor Nixon. I live in Indep and have been talking with Byron's mother. I would like to help any way I can. I will be hosting a fund raiser in March. Please contact me so I may ask you some questions. Byron's mother has my email. TSJ why have you not responded to the comments made above regarding Byron and Kelly both agreeing that Kelly broke off the relationship and therefore would weaken the "embittered" argument? I'm just beginning to look into this but it also seems that Byron's defense of the tape was that he was sick...not that it was manipulated in any way. Your citation of Wroblewski & Ellis (1970) is wrong. Between 2 hours and several days PM, the percentage of haziness is 74%, in stead of after 36 hours. This result is rther vague. Extrapolation of the other resultst yields 100% haziness after 12 hours. Other investigations suggest 100% after 24 hours.